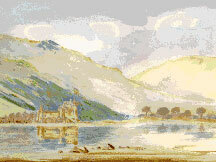 Painting: The Castle - a conversion from the artist Kenneth Duncan who is nearly blind. This design is on 18ct aida with some part stitches and sized 12.6 x 8 inches. All designs come neatly packaged as a complete kit including chart, aida, needle and threads already sorted onto cards. No more piles of threads! Painting: The Beach a conversion from an original painting by almost blind Kenneth Duncan. It is converted into 18ct aida with some part stitches and is sized 12.3 x 9 inches. All designs come neatly packaged as a complete kit including chart, aida, needle and threads already sorted onto cards. No more piles of threads!